Nicole Hammond hears voices in her head, but not in the crazy, kill people way you watch on TV. They are just a background noise in her mind that she drowns out with alcohol. That is, she does until she is kidnapped by aliens, and finds out that these voices are really the instructions on how to do repairs on an ancient starship called Fyrantha, which makes her valuable to the many factions fighting for control over the ship. As Nicole starts running a repair crew on the Fyrantha, she begins to realize how much is going on the ship and how much she hasn't been told. Learning how much her actions on the Fyrantha affects humanity as a whole, Nicole has decided that she will no longer be a pawn. Working with others on the ship, Nicole has decided to fight back. 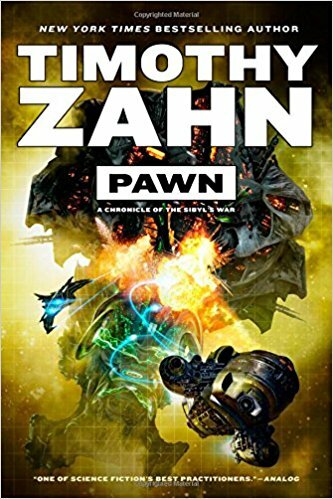 Timothy Zahn is definitely in my top five favorite authors. In Pawn: A Chronicle of the Sibyl's War he demonstrates many of the aspects of his writing that I love. He introduces interesting characters, a compelling premise, and a number of mysteries for our protagonist to solve. All of the main characters have understandable reasons for their actions, which makes them relatable when these are motives are discovered. I would offer one complaint on this book, which is that this is very much the first book of the series. There are a lot of plot points that I was hoping would be more fleshed out by the end of it, which made it fairly disappointing that, one, this book just came out, and, two, I didn't get as much of the story I wanted. However, I did end this book with the main character having made enough progress in the story and her personal development that I am excited about the prospect of what the rest of the series will bring.